This week, I’m going old school with Excel Saga, the wacky, over-the-top-never-knows-when-to-quit action-adventure-parody series from J.C. Staff! Nothing is too sacred or safe from Excel Saga. The 26-episode comedy series parodies everything from popular anime titles of the 80’s and 90’s to Jaws. That’s right, Jaws. If you’re familiar with anime and pop culture from those eras you won’t be too left behind. Though it references older anime and movie titles, it’s still enjoyable to a new audience because of the wide net it casts by parodying entire genres. The series follows the villains of ACROSS, documenting their attempts to conquer City F and maybe, eventually, the world. The leader of ACROSS, Illpalezzo, depends on lackey, loud-mouthed EXCEL and her sidekick Hatchan who’s in a perpetual state of dying. Unfortunately for ACROSS, and namely EXCEL, money to fund their endeavors doesn’t grow on trees, so she has to work part time odd jobs to make ends meet, otherwise the girls will have to eat their reserve rations, a small dog named Menchi. Meanwhile, their neighbors, the guardians of justice, fight to thwart ACCROSS’ plans but never fully realizing that EXCEL and Hatchan are members. That’s where the standard anime plot ends and Excel Saga becomes, well… a saga. Excel Saga is a relentless gag anime packed with standard characters that are pushed to the extreme in order to fit into the theme of the current episode as the Animation Director and Manga Artist try to find ways to make Excel Saga more appealing and profitable. That’s right. The Animation Director, his staff, and the original artist all make regular appearances. And EXCEL tries to kill them – sometimes. It’s a fourth wall breaking romp through genre after genre, leaving nothing untainted. When characters die (that’s a regular thing), the Macrocosm Ishi-san just brings them back to life and, in the case of a migrant worker, Pedro, from Chile, falls in love with him and helps him get revenge on the man who stole his wife. Meanwhile, cute aliens (Puchuus) attempt to invade City F and the series bounces between shonen, shoujo, seinen, mecha, rock star, and on and on and on. It’s never ending. And it just felt never-ending, sadly. I like the premise of Excel Saga. 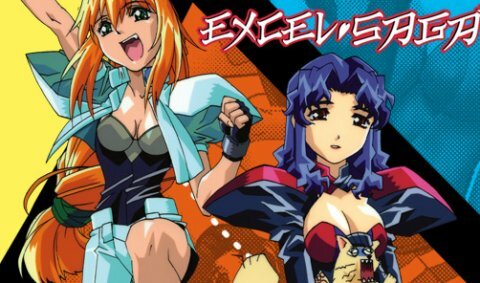 It’s impossible to sum up Excel Saga into a neat little bundle because it’s messy, raunchy, and plays dirty. It’s something you have to experience to understand. It pokes fun at itself, the industry, and anything else it can get its hands on: including sappy animal movies. I love this about the series. I also enjoyed Menchi’s stories and following the soap opera love of Pedro and his wife. The little jabs to the animation industry, specifically in regard to the creator’s ability to sway a series, are delightful and entertaining. I would have liked to have seen more of the Director versus the Artist instead of EXCEL, to be honest. Although, watching Hatchan die each episode was always entertaining. It was very reminiscent of South Park’s running gag of killing off Kenny. You knew it was coming, but you didn’t know how, when, or where. It sounds like a nice bit of entertainment! Nothing too thought provoking which is exactly what I like. I will give it a try.